Dog Racing. Imagine trying to get the Dr. IQ of dogs, the German Shepherd, to chase a mechanical rabbit around a track. (“Are you woofin’ me, pal? That toy looks about as much like a member of the Leporidae family as I do. I’m a police dog, you moron. I sniff out explosives, drugs, and, yes, even lost children —and your jugular vein is starting to sniff pretty good to me right about now. Now gimme a biscuit and beat it before I run you in.”) Of course, the world’s stupidest dog, the Greyhound, will chase that rabbit until the cows come home, at which point the dogs get very confused. I used to regard dog racing as a way to keep old geezers in Florida from wandering into the Everglades. They could chew on unlit cigars, bet on the pooches, and in between races bet on who could hitch their trousers up the highest. Yet, there used to be a dog track in Naples. It was at the far west end of the gigantic Mostre d’oltremare, the Overseas Fair Grounds, adjacent to the zoo. (“You’d better run, Fido. It’s gettin’ on to meal time over there in the tiger cages.” Nothing like a little incentive!) I used to hear the barking as I drove by, but instead of doing something productive, such as chase my hubcaps, the dogs were in there going round and round. At a certain point, the barking grew silent (sniff, cue the violin music). The city closed down the place in 2001 after a series of protests by goody-goody animal rights groups. Cruelty to animals, they said. I checked recently. 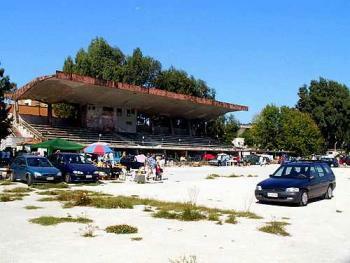 The grandstand is still there (photo, above), but the entire track and infield is given over to a giant flea-market (the fleas are left over from the dogs) and—on non-market days—a parking lot. Jai-Alai. This is the native Basque ball sport, the self-proclaimed “world’s fastest sport,” and that’s probably true unless you count hunting as a sport, in which case a speeding bullet is marginally faster than that hard rubber ball that the players fling off the walls of the huge fronton, the Jai Alai court. That is the Basque name; it is also called by the Spanish term, pelota. There has been an international Jai Alai federation since 1929 and the sport has often been a demonstration sport at the Olympic Games. Jai Alai is popular in Mexico, parts of the U.S., Spain, France and in parts of Italy, including the Naples of once upon a time. 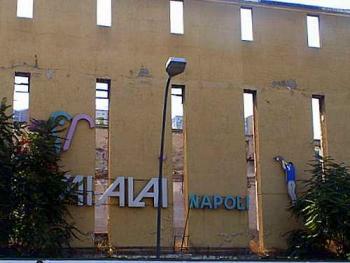 The Jai Alai fronton in Naples was built in the 1940s in the Fuorigrotta section of the city. The arena covered a city block and held more than 2,000 spectators. I am not aware that there was an actual Jai Alai League in Italy; the sport was local, as were the players. Gambling was intense. The arena burned down early in the morning of the last day of 1986. Of course, that was the year that Naples won the Italian soccer championship, so no one really cared about the fate of a truly minor sport such as Jai Alai. “Everyone knows” that the Mob burned down the place. No one seems, though, to know exactly why. It couldn’t have been to put up its own Mob building since the empty burned-out shell of the building has been standing there for decades. There is some talk of putting in an ice-skating rink on the property. (Presumably, the Mob doesn’t know that ice can be rapidly sublimated to steam by the application of heat.) Work was supposed to start in 2007, but according to a local paper, "the workers didn't show up." (That's fearless investigative journalism for you! Why not just say that if the Mob doesn't want you to play Basque-t Ball, why would they possibly want you to ice-skate? A flabby populace is a vulnerable populace.) There is also opposition to any such frivolous use of the building from quarters that see the premises in the role of something more socially relevant such as a center for activities for youth or the elderly. So, who says that kids and old people might not enjoy some time on the ice?